If you are like me, you LOVE a good deal. So I have thought of a way to give you all kinds of opportunities to get great deals on a weekly basis. 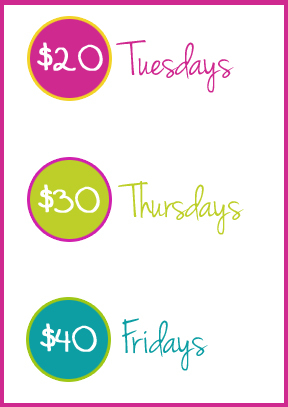 Three times a week, I will offer one item at a greatly discounted price: $20, $30, or $40. Or sometimes, I will combine all three items in one blog post and just offer them all to you at once. BUT - in most cases there will only be one or two of each item so act quick or they'll be gone! After that day or week, they will either be removed from the website or will go back to their original sale price. The sugar on top? FREE shipping, and you will automatically be entered to win a $50 gift certificate! Each deal will be announced on my facebook page as well as this blog each week. If you are not a facebook fan yet, click here to become one, or sign up to receive my blog via your email (see top right of this blog) so you don't miss out!